Position rack in bottom third of oven; preheat to 350°F. Spray two 9-inch cake pans with 1 1/2" sides with nonstick spray. Line bottoms with parchment; spray parchment. Whisk flour and next 4 ingredients in large bowl. Using electric mixer, beat butter in another large bowl until smooth. Beat in brown sugar. Add eggs 1 at a time, beating to blend between additions. Beat in pumpkin. Add dry ingredients to butter mixture in 3 additions alternately with milk in 2 additions, beating to blend between additions. Divide batter between pans. Bake cakes until tester inserted into center comes out clean, about 40 minutes. Cool in pans on rack 15 minutes. Run knife around cakes to loosen. Invert cakes onto racks. Remove parchment. Using tart pan bottom as aid, turn cakes over onto racks, top sides up, and cool completely. DO AHEAD: Can be made 1 day ahead. Wrap cakes in plastic and store at room temperature. Using electric mixer, beat butter in large bowl until smooth. Add cream cheese and orange peel; beat until smooth. Add powdered sugar and beat on low speed until smooth. Trim rounded tops from cakes. 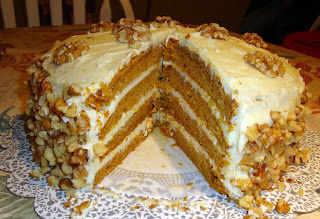 Using long serrated knife, cut each cake horizontally in half. Place 1 cake layer, cut side up, on large platter. Spoon 2/3 cup frosting atop cake in dollops; spread to edges. Repeat 2 more times with cake and frosting; top with remaining cake layer, cut side down. Spread remaining frosting over top and sides of cake (layer will be thin). DO AHEAD: Can be made 2 days ahead. Cover with cake dome; chill. Let stand at room temperature 1 hour before serving. 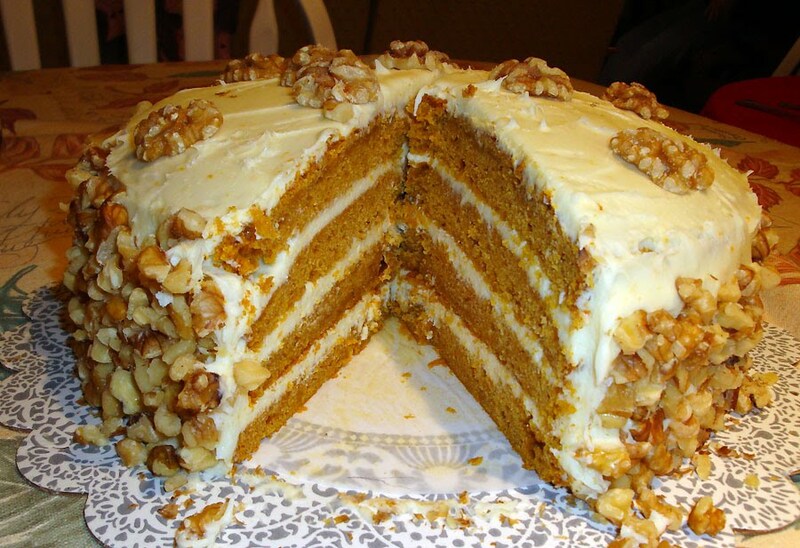 Decorate cake with walnuts and serve.